Prepare yourself these snacks for diabetics, and don’t let hunger bangs get the best of you. Discover how delicious low-carbohydrates snacks can be. Parties mean having fun, and having an overdose of fat, calories, and carbohydrates. Luckily, adopting a healthy low- carbohydrate lifestyle does not mean giving up party foods. 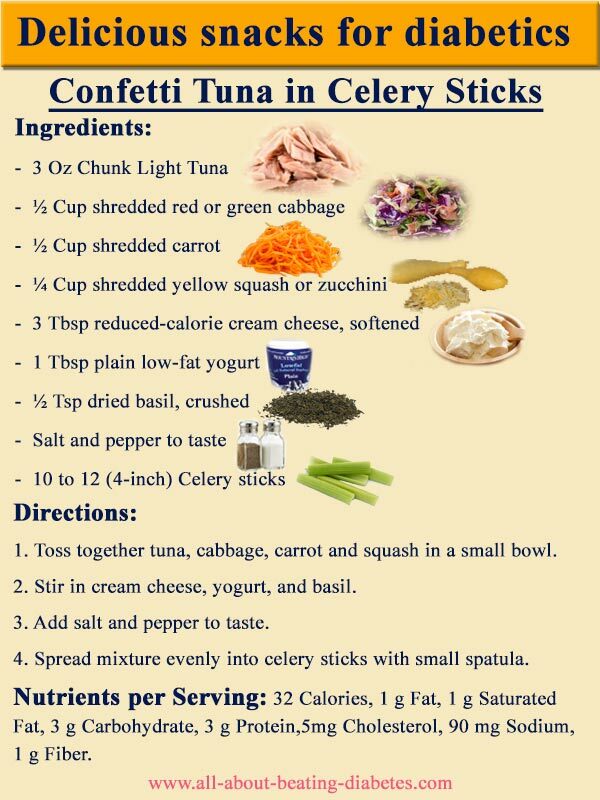 You can enjoy snacks for diabetics like Confetti Tuna in Celery Sticks, Angelic Deviled Eggs, and Turkey Broccoli Roll-Ups. 1. Toss together tuna, cabbage, carrot and squash in a small bowl. 2. Stir in cream cheese, yogurt, and basil. 4. Spread mixture evenly into celery sticks with small spatula. You can make 10 to 12 servings with these ingredients. Nutrients per Serving: 32 Calories, 1 g Fat, 1 g Saturated Fat, 3 g Carbohydrate, 3 g Protein,5mg Cholesterol, 90 mg Sodium, 1 g Fiber. You can enjoy these snacks for diabetics at your next social gathering or family get-together parties. is a another delicious and easy recipe suitable for all occasions. 1. Boil the eggs in medium saucepan over medium heat. 2. Remove from heat; let stand until eggs are cool, drain and remove shells from eggs. 3. Cut eggs lengthwise in half, remove yolks, and reserve 3 yolk halves. 4. Place egg whites, cut sides up, on serving plate, and refrigerate while preparing filling. 5. Combine cottage cheese, dressing, mustard and reserved yolk in the food processor until smooth. 6. Transfer cheese mixture to small bowl, and stir in chives and pimiento. 7. Put mixture into egg whites; cover and chill for at least 1 hour. Nutrients Per Serving: 24 Calories, 1 g Fat, <1g Saturated Fat, 1 g Carbohydrate, 3 g Protein, 27 mg Cholesterol, 96 mg Sodium, 1 g Fiber. is a recipe everyone in the family will certainly love, serving not only as snacks for diabetics. 1. Arrange a single layer of broccoli spears in a microwavable dish and add 1 tablespoon water. 2. Cover the dish with vented plastic wrap, and microwave at HIGH (100%) 6 to 7 minutes. Remove carefully plastic wrap; and immediately place broccoli in cold water to stop cooking; drain well. 3. Combine sour cream, mayonnaise, juice concentrate, mustard and basil in small bowl; mix well. 4. Cut turkey slices into 2-inch wide strips, and spread sour cream mixture evenly on strips. 5. Place 1 broccoli piece at short end of each strip; starting at short end, roll up tightly. 6. Place on serving plate; refrigerate until ready to serve. 7. Garnish just before serving, if desired. Nutrients Per Serving: 51 Calories, 1 g Fat, <1g Saturated Fat, 4 g Carbohydrate, 7 g Protein, 10 mg Cholesterol, 259 mg Sodium, 2 g Fiber. Once again : Buon Appetite!